We've all heard stories or perhaps even witnessed leaders who just can't keep their cool. They may storm through the office, slam a phone down, berate a manager or simply send dozens of nasty emails. This type of behavior is extremely uncomfortable for employees to witness, eats away at organizational culture, breaks down trust and is completely unproductive. What would cause a leader or manager to behave that way? It could be anything. Maybe they are having family problems, or their brand new car broke down for the twelfth time or their stakeholders came down hard on them that morning. The truth is it doesn't matter why a leader behaves in such an explosive way. If the leader had a high Emotional Intelligence Quotient (EQ), this behavior wouldn't be happening regardless of the reason. But what exactly is Emotional Intelligence? Let's go to the source of the popularization of the term -- Daniel Goleman. In this short video, Goleman explains exactly what Emotional Intelligence is. Now that you've been refreshed on the definition of EQ, and I've explained how it can improve the bottom line, maybe your EQ needs refreshing too. In my last post I talked about how active listening plays a huge role in the EQ of leaders and managers. But there is more to EQ than listening skills. 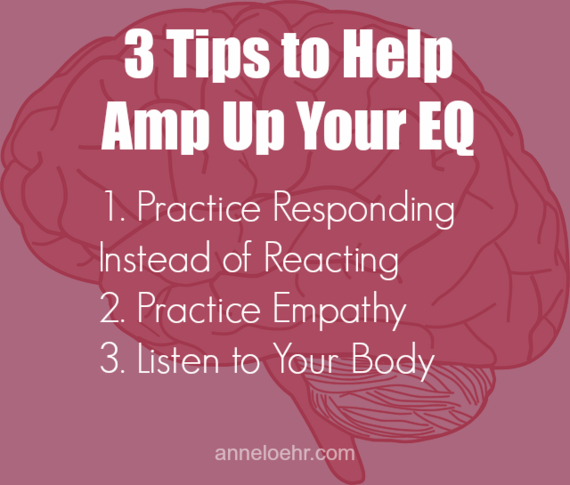 Today I will give you three steps to improve your active listening skills and three tips to improve your EQ as a whole. First, let's talk about active listening. There are five parts of communication -- what's said, what's not said, words, tone of voice and body language. Active listening is the process of fully attending to all parts of someone's communication. Truly listening to someone is more difficult than it seems and requires practice. What do you hear? Restlessness? Calm? What do you see? Head-nodding? Phone use? Taking notes? What does your EQ say? They're losing interest? Or: They like this idea! Practice each step of listening until you feel you've mastered all three. Ask a few non-biased people if they perceive you as a good listener. Then actively listen to their responses! Active listening will greatly improve your leadership, and will benefit all of your relationships -- inside or outside the workplace. Can you tell the difference between responding and reacting? The difference is subtle. Reacting is something you do unconsciously when faced with an emotional trigger. Responding is a conscious behavior-- you notice how you feel in response to an emotional trigger and then decide how you want to react. For example, let's say you're in a meeting with a team that you feel never listens to you. As you begin to share an idea you had for solving a common issue, a team member interrupts you by speaking over you entirely and explaining her idea. If you react, you may snap at that person. But if you respond, you'd notice that you felt anger, figure out why and make the decision to calmly tell your team member that it is important to you to be able to share your ideas with the group, and you'd love to finish your thought before they began to speak. It's obvious which outcome will be more favorable. Empathy is the ability to understand and share the feelings of another. In leadership, this is especially important for building trust. If you notice one of your star performers coming to work later and later each week, don't write them off as a bad employee. Instead, talk to them about the real reason they are running late. If they are willing to share that information with you, try to put yourself in their shoes and understand where they are coming from. Respond to them with understanding. If they aren't willing to share, think of a time in your own life where you behaved similarly, and examine why. Were you dealing with family issues? Were you feeling unappreciated? Were you not being challenged? Eliminate snap judgments and consciously practice empathy. Does your heart race when your CFO walks into the room? Do you have a knot in your stomach when someone mentions merging with a larger organization? These are messages from your body and you must listen to them. Pay attention to how you feel in various situations. Decide what those feelings mean so that you can respond to them with the powers of reason. 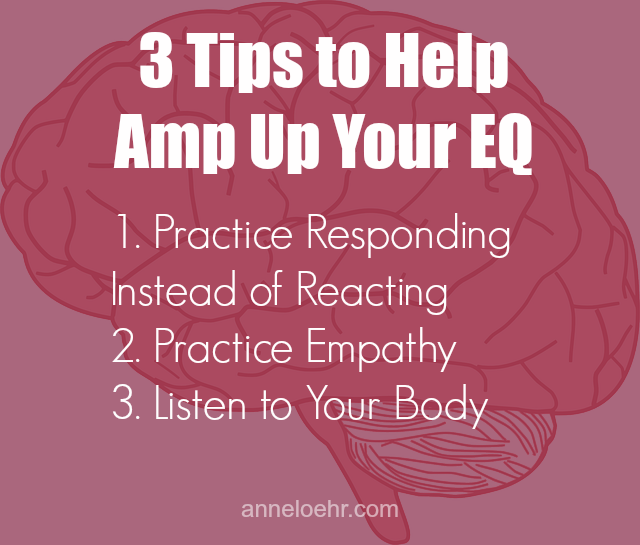 In short, you can improve your EQ by practicing active listening, empathy, responding rather than reacting and listening to your body. But it's important to remember that developing Emotional Intelligence is a lifelong practice, and there is always room for improvement. Here's a question for you: Can you identify the most emotionally intelligent person you know? How can you tell? What types of behaviors indicate her high EQ? I'm excited to hear these responses. Please leave a comment below, send me an email, or find me on Twitter. Anne Loehr is a sought after keynote speaker, writer, consultant and trainer. She helps leaders in large organizations connect their everyday decisions today to the future workplace. Her end goal is to help organizations retain their top talent and not only survive, but thrive. To learn more about Anne, check out www.anneloehr.com or follow her on Twitter.